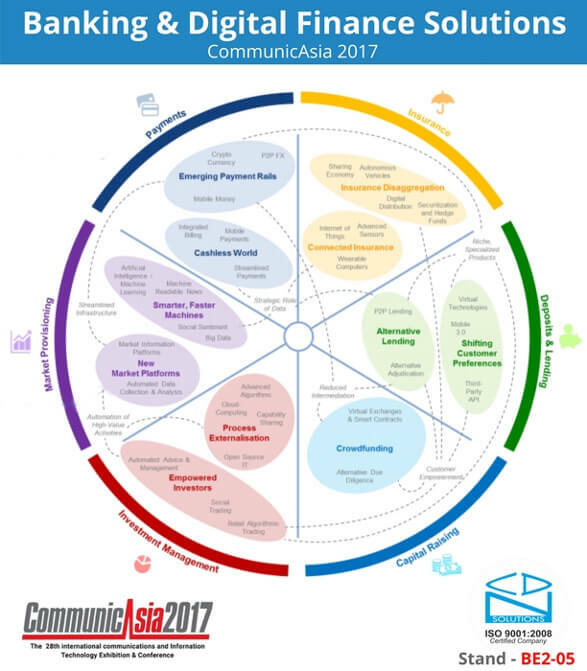 CDN Solutions Group is a trusted name in IT industry and the company will showcase promising solutions in Digital Finance and Banking in CommunicAsia 2017 Singapore at booth BE2-05. Top IT outsourcing company CDN Solutions Group have rich experience of 17 year in business to uncover latest digital finance and banking solutions possibilities in the mega ICT expo CommunicAsia 2017 during 23rd to 25th May 2017 in Marina Bay Sands, Singapore. As a leading technology solution provider company, we are acquainted of new digital finance and banking trends. We have developed many banking solutions (Web, Mobile, Desktop) for our clients wrapped up with advance and latest technologies such as AI, advanced machine learning, open API, chatbots, blockchain, etc. When it comes to Digital Finance, we have implemented technology features like regtech, advanced analytics, big data and cloud, etc. Know more about these technologies below. In 2017. the new technologies will offer more contextual, more personal and ultimately unique banking experiences for each and every bank user. Find some latest banking solutions to adopt in 2017 for banking business below. Artificial Intelligence (AI) & Advanced Machine Learning (AML): Developing system & softwares that adapt, learn and respond autonomously rather than simply execute predefined instructions will be the upcoming banking scene. And this will make possible because of Artificial Intelligence and Advanced Machine Learning technologies. Know more about this by contacting us here. The Open API Bank: Open API means accessing banks as a platform in which transparency will be an asset. In 2017, open API will become the face of online business. Open API enable users to become more available for people to innovate. By the end of this year, open API will count as a business model in banking solutions. Chatbot: Conversational commerce is the most trending topic in banking business. Chatbots are software programs pretending to be people that can interact with through voice or text. Users can talk to these chatbots in messaging applications, websites or voice enabled devices. The below trends to expect in the world of digital finance this year that will change the way of banking. Regtech will Rise: Regtech is an area where everyone can manage legal risks more easily and more cost-effectively by co-operating each other. Regtech solution is the new trend in digital finance to reduce compliant costs. Enhanced customer experience: Simpler is always better when it comes to customer experience. in 2017, Digital finance to adopt solutions that will enhanced customer experience by providing more personalized financial services that include areas like savings deposits, mortgage and payments. Advanced Analytics and Big Data: Advanced analytics and big data are not new in Digital finance industry, but in 2017, these technology will use to deliver individualized engagement and personalized services to users. Now the fintech and banks will utilize the big data with the help of advanced analytics to benefit the consumers. So these are some of the hot and trending technology solutions of digital finance and banking. We will uncover and discover more hot trends and solutions in the largest ICT expo CommunicAsia 2017 at stand BE2-05 in Marina Bay Sands, Singapore during 23rd to 25th May 2017. Fix a meeting with us here to know tailored solutions for your business. SaaS Vs. Custom e-Commerce platforms – Which is better for Retailers?